I saw my first barn quilt years ago on a beautiful, weekend drive to Madison, Indiana. 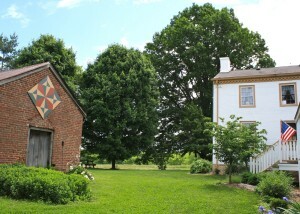 Since then, I have seen barns decorated with large, colorfully painted quilt squares in many places we have traveled. The history of barn decoration likely traces back to the Pennsylvania Dutch and the star-like patterns they painted on their barns, often in hexagonal shapes. Early in the 20th century, barn personalization gained popularity, with artists incorporating folk designs and geometric patterns from quilt squares. A resurgence of the craft began in 2001, in Ohio, when Donna Sue Groves wished to paint a quilt square on her barn to honor her mother’s handwork and Appalachian heritage. She turned her wish into a driving trail of twenty barn quilts to inspire visitors to the Ohio countryside. And now, the American Quilt Trail winds through 27 states, including Kentucky, providing a “clothesline of quilts” in some of the most beautiful countryside. In 2010, I painted my first quilt on plywood, to hang on our brick smokehouse. A few years later, I painted a smaller 2’x2’ one in a traditional double wedding ring pattern, as a gift to celebrate a very special marriage. Since then, my wooden quilts have become a delightful distraction! I propose that barn quilts can come out of the pasture, and onto the garage or porch, or even inside, to bring a fresh look for a bit of Americana. Check our photo gallery for designs I have painted. Or check your linen closet (or your grandmother’s) for quilt patterns meaningful to you! Quilting has long been a family tradition, and beautiful quilts are some of the best gifts handed down from one generation to the next. Commissioning a one-of-kind painted quilt to match your own impeccable taste or family heritage is simple, just e-mail catherine.clore@barnquilts.net or call me at 502-387-6430 for more details.